Outdoor Lifestyle Center offering a Dynamic Mix of Premier National Retailers, select Local Merchants and Specialty Restaurants reflective of Local demand and fashion trends. 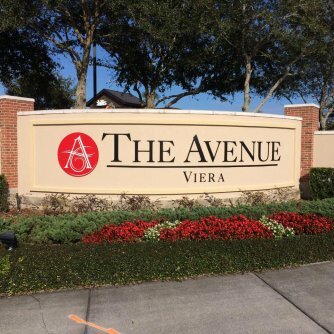 Welcome to The Avenue® Viera! This picturesque outdoor lifestyle center in Viera, Florida consisting of 600,000 square foot of lifestyle tenants on 62 acres. Offering a diverse mix of over 20 restaurants, over 70 retail stores focused on apparel, accessories, home furnishings, jewelry stores, cosmetic, health and beauty and specialty stores and more. And if you want to sit back and relax while others shop you can enjoy snacks and a movie at the AMC® Movie Theater. The Avenue® Viera has a unique outdoor shopping atmosphere that encourages guests to relax and stay awhile. Visitors can enjoy palm tree lined sidewalks, a Central Park green space with fountain, patio dining and storefront parking. The Avenue® Viera is located on Florida’s Space Coast and conveniently located off Interstate 95. The Center’s surrounding community consists of a 20,000 acre, master planned community with 58 neighborhoods. The Avenue® Viera experience awaits you! A Bag Full of Savings!